Student movements; History; 21st century. How xerography became a creative medium and political tool, arming artists and activists on the margins with an accessible means of making their messages public. This is the story of how the xerographic copier, or âXerox machine,â became a creative medium for artists and activists during the last few decades of the twentieth century. Paper jams, mangled pages, and even fires made early versions of this clunky office machine a source of fear, rage, dread, and disappointment. But eventually, xerography democratized print culture by making it convenient and affordable for renegade publishers, zinesters, artists, punks, anarchists, queers, feminists, street activists, and others to publish their work and to get their messages out on the street. The xerographic copier adjusted the lived and imagined margins of society, Eichhorn argues, by supporting artistic and political expression and mobilizing subcultural movements. Eichhorn describes early efforts to use xerography to create art and the occasional scapegoating of urban copy shops and xerographic technologies following political panics, using the post-9/11 raid on a Toronto copy shop as her central example. She examines New York's downtown art and punk scenes of the 1970s to 1990s, arguing that xerographyâincluding photocopied posters, mail art, and zinesâchanged what cities looked like and how we experienced them. And she looks at how a generation of activists and artists deployed the copy machine in AIDS and queer activism while simultaneously introducing the copy machine's gritty, DIY aesthetics into international art markets. 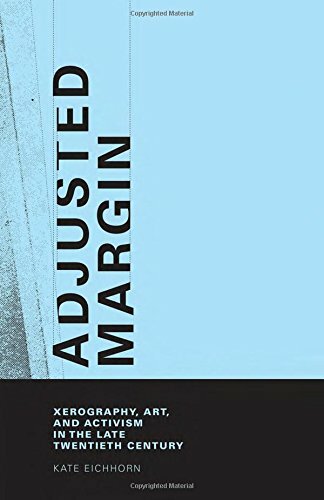 About: How xerography became a creative medium and political tool, arming artists and activists on the margins with an accessible means of making their messages public.